The only real mildew/disease resistant Busy Lizzie variety to grow. Perfect planted in groups in beds and borders, or in big pots, about 20-25cm apart. At last, the New Guinea Divine Busy Lizzie offers a real mildew resistant alternative to seed-raised Busy Lizzies. 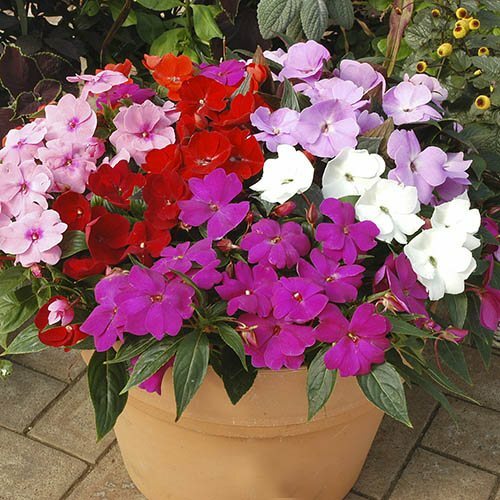 Their lovely bright colours are set against deep-green and tough leaves, and planted about 30cm apart they provide a carpet of colour in any border, bed or patio planter. A real breakthrough for British gardeners that delivers every year. Supplied as a collection of 24 jumbo plugs (2.5 - 3.5cm diameter). Ready to plant into pots & baskets.